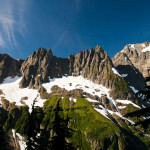 Looking for great North Cascades fall destinations? Nothing beats the historic town of Stehekin for fall adventure. Photo by John Chao, courtesy of The National Park Service. Before the winter snow (and cold rain) starts to make outdoor excursions more a practice of survival than outdoor recreation, checkout Washington’s North Cascades region for wild recreation, wine tasting, and magnificent sightseeing opportunities. The North Cascades National Park serves as the recreational hub, but outside the park the area comes alive with magical experiences from the wild to the refined. Come with Seattle Backpackers Magazine as we take a tour of the area, stopping to highlight some of the special places adventurers can find in this gem of the northwest. Starting our trip in the north and approximately 31 miles east of Bellingham, Wash., you will find picturesque Mount Baker. At 10,781 ft., Baker is one of many active volcanos in the Cascade Range and the second most active after Mount Saint Helens. The mountain is a favorite of climbers, hikers, and snow sport enthusiasts. Baker offers downhill skiing in the winter months with the season normally running from late November to early spring. When ski season is over, the mountaineers arrive to attempt one of the premier alpine climbing experiences in the Northwest. Hikers and backpackers can enjoy the unspoiled wilderness and dramatic fall colors throughout November. White water rafting is also available in the area on the Nooksack River. Stop at the Glacier Public Service Center to plan your trip into the northern reaches of the Mt. Baker-Snoqualmie National Forest. Fire lookouts are a part of Washington’s history. Let your North Cascades fall destinations take you to some of the region’s best views. 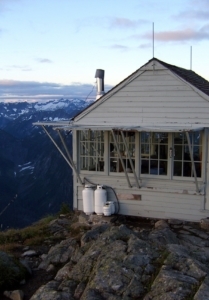 Copper Ridge Fire Lookout, photo courtesy of The National Park Service. They say “getting there is half the fun,” and with the North Cascades Scenic Byway this is true. After enjoying Mount Baker, head south and catch the North Cascades Scenic Byway. The byway winds 140 miles from Sedro-Woolley to Twisp and is part of the 400 mile scenic Cascade Loop. Stop at the Wilderness Information Center in Marblemount for the latest conditions and for help planning your fall adventure. Continuing east, skirt the translucent green waters of Ross Lake before heading up into the mountains and awe-inspiring views of rock spires, hanging valleys, waterfalls, and alpine glaciers that give this area the nickname, the “North American Alps.” Reaching the high desert of the Methow Valley, enjoy all types of outdoor recreation, charming restaurants, and vibrant nightlife. The byway is a favorite with cyclists looking to test themselves on the steep inclines. Many of the popular hiking and climbing routes in the area start on trailheads adjacent to the byway. This road truly traverses wild places and is therefore a seasonal road. Check the latest travel advisories because the byway closes in late November when heavy snow hits the pass. Our next stop is the Ross Lake National Recreation Area for fall kayaking, camping, and a visit to the famous Ross Lake Resort. Ross Lake is approximately 20-miles long from Ross Dam in Washington State to southern British Columbia. Enjoy off-season quiet and watching the changing colors from the seat of your kayak or canoe. Kayaking and canoeing are popular fall activities on the lake and the area features 19 boat-in campsites available along the shores for adventurous paddlers with a backcountry camping permit. There is no direct road access to the Ross Lake; canoes, kayaks, and other portable craft can be launched on Diablo Lake and paddled five miles to the end of the lake and then ported over a mile around Ross Dam (that will get your heart pumping!). Visitors can also hike to Ross Lake or take the Diablo Ferry. Ross Lake Resort provides portage and water taxi service on the lake and rents out small power boats, canoes, and kayaks. The resort was established around 1952 from an old floating logging camp. The resort offers 12 individual cabins and three bunkhouses built on log floats. Guests can enjoy the scenic mountain views and kayak from their front door at this one-of-a-kind remote resort. Accommodations are available by reservation from mid-June to October 31, so put this destination on your list for next year. 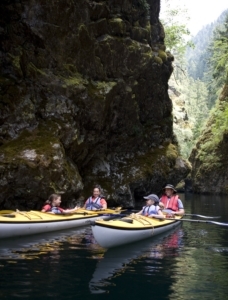 Kayaking Ross Lake is one of the fun North Cascades fall destinations for the whole family. 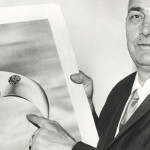 Photo courtesy of The National Park Service. Continuing down the North Cascades Scenic Byway will take travelers through Mazama, Winthrop, and Twisp. These towns serve as the cultural and recreational hubs of the North Cascades. 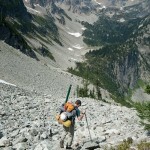 Mazama is on the Methow trail system and near well-maintained rock climbing routes. Mazama is a popular stop year-round to fuel-up with great food and supplies at the Mazama Store while cross-country skiing, mountain biking, fishing, or hiking the Pasayton Wilderness. Pedal power is a great way to enjoy fall colors, bike rentals are available in Mazama along with outdoor supplies and friendly local advice about the best places to go. The Old West town of Winthrop is next on the list of stops. Winthrop has great restaurants and eclectic shops. Outdoor gear and bikes can be purchased or rented at many of the outfitters that call Winthrop home. Finally, at the confluence of the Twisp and Methow Rivers is the town of Twisp. Twisp is home of a thriving artistic community that draws inspiration from the region’s natural beauty. Stop for lunch and watch the golden leaves sway in the breeze on the banks of the Methow River. Our tour ends at Stehekin, the quiet lake town nestled into the headwaters of Lake Chelan. The remote town is connected to the outside world by foot, boat, or float plane. 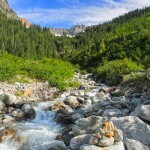 The journey to Stehekin is part of the charm and ensures a quintessential North Cascades experience. Early settlers established homesteads in Stehekin in the late 1800s and engaged in logging and agriculture. Today there are several lodges and restaurants in town and approximately 78 campsites. Free backcountry passes are required for most campsites; check with the Golden West Visitor Center for details. Stehekin serves as a hub to explore the Lake Chelan National Recreation Area and offers hikes for all abilities. Visitors can also rent bikes and kayaks in town and even go horseback riding. No trip to Stehekin is complete without visiting the Stehekin Pastry Company for amazing pies and cinnamon rolls. While it is possible to hike into the town, most visitors arrive on the Lady of the Lake ferry from Chelan. Lake Chelan is over 50-miles long and the third deepest lake in the United States. The lake hosts all types of water sports and fishing and is a great fall destination. After a day hiking and taking in the fall colors, try one of Lake Chelan’s 24 shore side wineries and enjoy placid lake views while sipping some of the best wines in the country.